Disclaimer: Graphic images are included, and are shown on pointer hover. Tiny hands, still and lifeless, at the ends of two severed arms - surrounded by pools of blood, dwarfed by the dollar coin they had been placed upon to show to scale these small yet perfectly-formed features. This was the first photographic evidence I saw of what I had read, heard, and known all along: abortion violently kills a human being. We have all heard the familiar adage, a picture is worth a thousand words. At its heart, it means an image can communicate something much more accurately and swiftly than words can. Throughout history, many whose aim was to expose the truth and fight injustice utilized graphic pictures after years of using words proved ineffective. Each time -the picture was the catalyst for the movement’s eventual success. It was after William Wilberforce and his team of abolitionists brought the people of Britain graphic illustrations of the harsh treatment endured by slaves in the colonies that the tide began to turn and more people began to question the morality of the slave trade. Thomas Clarkson said one illustration, of a slave ship lined with row upon row of slaves, made “an instantaneous impression of horror on all who saw it,” forcing the viewer to face the reality of what was happening daily out of sight. After graphic photographs of Jesse Washington’s lynching were published in a supplement of “The Crisis” magazine, the anti-lynching movement gained thousands of new supporters and refreshed momentum. Only after seeing the photographs of emaciated, naked bodies piled high upon one another in mass graves did the public begin to realize and believe the horrific truth that hundreds of thousands of Jews had been tortured and gassed to death in Nazi concentration camps. And it was after “Jet” magazine, at his mother’s request, published the photograph of the body of Emmett Till in his open casket, unrecognizable after being savagely beaten, shot, mutilated, and dumped in a river, that Rosa Parks refused to give up her seat on a Montgomery bus and ignited the civil rights movement. “I thought of Emmett Till, and when the bus driver ordered me to move to the back, I just couldn’t move,” Parks later said. The pen may be mightier than the sword, but oftentimes the picture can be mightier than the pen. But, here is the tension... pictures such as these are not comfortable to look at — nor are photographs of aborted children. These are not images people will rush to frame and display on their walls. So why bother showing them, if they are going to upset or shock people? Because they are documented evidence of the evil which flourishes in the dark. And, the only way such deep darkness can be dispelled is by bringing these shameful deeds into the light. The evidence must be seen, as disturbing as it is. And the reality the photos so clearly and unquestionably display must be acknowledged. Only by exposing the horror is the full scale of the previously-invisible injustice revealed. This is why the pro-abortion lobby hates photos of aborted babies. The photos completely and utterly obliterate their “clump of cells” argument. They reveal the disturbing fact abortion does not only involve a woman’s body, but a small, vulnerable child’s body, too. Pictures cut through all the facades, buzzwords, and false propaganda and make it undeniably clear abortion is not a socially responsible procedure, but the premeditated killing of another human being. Graphic abortion photos make it impossible to avoid the reality that abortion violently ends the life of a preborn child. They leave no room for doubt. There is a human being, clear to be seen. There is blood. There are lifeless bodies and severed body parts. The truth is revealed: a human being has been killed in an extremely violent manner. Abortion photos expose the humanity of the preborn child and the horror of what abortion actually is. The photos lift the lid off the casket and show the world not only that the preborn are human, but they are being mutilated, torn limb from limb, and murdered. The pro-life lobby could speak endlessly of the injustice and evil of abortion, and we would be right to do so. But one photograph can communicate the truth in a way no words, however powerfully arranged or orated, ever could. We don’t protest abortion. We expose abortion. When you hold up an aborted baby photo, abortion protests itself. Many pro-life supporters fail to use abortion photos because they do not want to shock or offend people, but these photos are key weapons in the war against falsehoods surrounding the abortion debate. What I am about to say may seem harsh at first glance, but upon deeper reflection will make sense: The vast majority of abortion supporters need to be shocked. This is because they are either willfully ignoring the truth, unwittingly embracing a fabrication, or completely unaware of the need for life-affirming action. They need to understand the horror of what abortion is and does. They need to be awakened to the brutal reality of what is happening every minute around the world, to thousands of preborn babies every day. In years gone by, people heard about the gas chambers, the skeletal bodies of those herded into them, the towering heaps of lifeless men, women, and children. They heard about African-Americans being lynched, tortured, and murdered. They heard about slaves being crammed into ships. Some believed what they heard, some did not. But when they saw the pictures, they were obliged to realize the truth was far more horrific, devastating, and evil than they could ever have imagined — and it compelled them to action; to overturning the wicked regimes which had crept into their society and allowed their fellow human beings to be treated like dirt. The same is true of abortion today. Many people have heard the arguments. They have been told the facts. Now, we must show them the evidence. I will start it off… look back at the beginning of this article, where I described those tiny hands that I can never forget. Feel the weight, imagine the shock. Which presentation gave you a fuller understanding of the horrific reality of abortion? I think I know the answer: the picture. The unavoidable evidence of human life and its brutal extinguishment. The evidence those who rally for “choice” and “rights” wish to keep hidden. We must not allow injustice to remain hidden. But, how can we expose it most effectively? 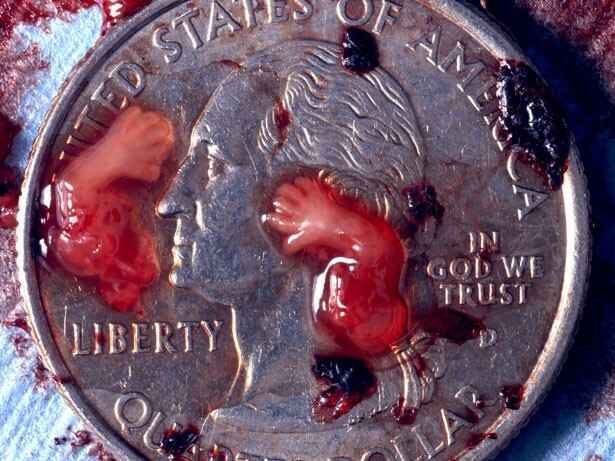 There are many who label graphic images of abortion as too offensive, too controversial. Too disturbing. So they refuse to use them at all. Others display them freely and without warning; using them so frequently they soon grew oblivious to the severity of the circumstance the images portray. So, how do we find the balance? Where’s the bullseye? How can we use the full force of this vital weapon without repelling or desensitizing people? By following the Apostle Paul’s instruction in Ephesians 4:15. He urges us to “speak the truth in love.” I believe the same principle applies for showing the truth. Let us use these powerful weapons to show the truth in love. Let us remember the humanity of the child in the photograph, and the person seeing it. Let us love both of them, giving respect and dignity and compassion to both. Let’s be wise, be loving, but let us be bold. We must not use gentleness as an excuse to shrink back from revealing the horrifying brutality of abortion. We must show the truth in love. We must show it, no matter the consequences. We must open the casket, as Mamie Till did with her mutilated son, so the whole world can see what inexpressible and indefensible injustice abortion is doing daily to thousands of precious children. Now, thanks to a mother’s determination to expose the barbarousness of the crime, the public could no longer pretend to ignore what they couldn’t see. We often hear how this is the generation that will make abortion unthinkable and obsolete — unsurprisingly a brand new teen-led pro-life organization is helping prove just that.